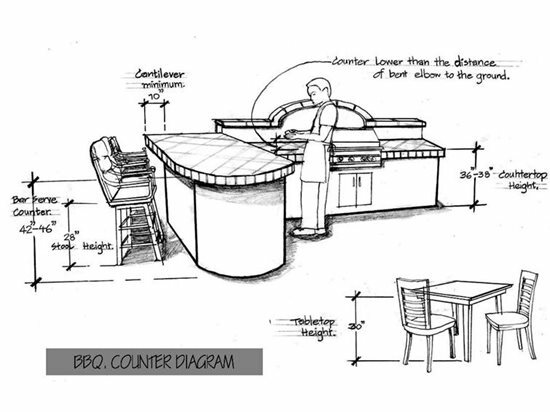 When designing an outdoor kitchen, it's important to know the industry standard heights for comfortable dining at a table, for working at a countertop, or for sitting at a bar. Countertop standard height is 36" tall. At times it is necessary to raise heights to 38"to accommodate a fridge. Comfortable range for most is 36-38". Always design your counters lower than the distance of your client's bent elbow to the ground. Bar serve counter height varies from 42"-46" tall. If you plan to use bar stools, select them ahead of time and let the height of the seat dictate your final bar counter height. Bar stools are typically 28" tall, but there is much variance depending on styling and manufacturer. Cantilever a minimum of 10 inches to allow room for knees on any type of counter. Tabletop height standard is 30 inches tall.